In our very first episode of Design we will be taking a look at Enigma from the original Dota and analyzing how his design, lore, and philosphy have changed in Dota 2. Our inaugural hero has stayed consistently unchanged since the original Defense of the Ancients (henceforth referred to as Dota 1). 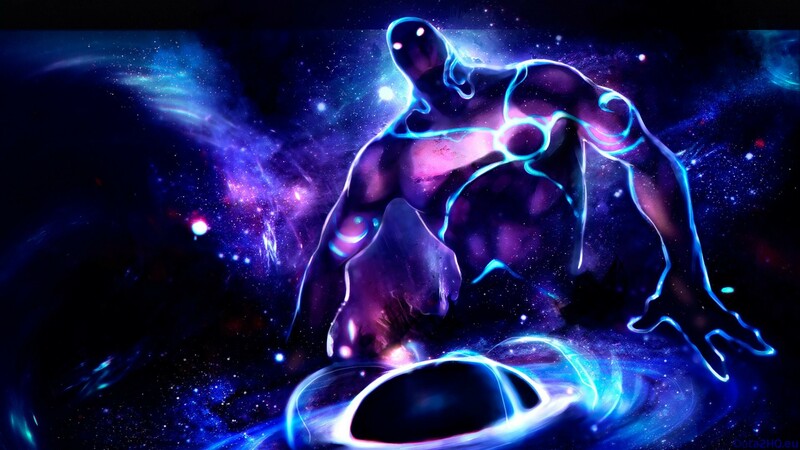 Enigma was always notorious for his powerful ultimate Black Hole, and it is because of this spell that he has remained a constant in the Dota scene. In Dota 1 he went by a much different name: Darchrow. "Enigma" was simply the moniker of his hero type; however, it was the name Enigma that stuck in the general Dota lexicon, and so to this day he continues to be referred to by that designation. Back then Enigma was gigantic amorphous creature. On the battlefield he hulked over opponents and allies alike, and instead of using actual voicelines, emitted only deep, menacing drones. Observant players could also make out a faint skull behind his glowing eyes. All of these characteristics coalesced to give the hero a very otherworldly and unknowable feel. He was a mystery, truly earning the right to be called Enigma. A little bit of trivia: Enigma's model in Dota 1 was actually a modification of the Archmage's Water Elemental in Warcraft 3 (the Water Elemental itself was used as the basis for Morphling's model). The jump to Dota 2 saw him get a notable visual overhaul. But while Enigma still resembled his old self, his overall design during the Dota 2 beta can be accurately described as bland. The official lore states that "Nothing is known of Enigma’s background. There are only stories and legends, most of them apocryphal, passed down through the ages." He is by definition a mystery; but upon arrival in the beta, Enigma did not look very mysterious at all. He just looked like a tall blue human. After a longstanding outcry for change he was finally granted a remodel with the 7.00 The New Journey update; his textures were given a huge upgrade. In his lore it is suggested that he might be a collapsed star, an extension of the void of space, and indeed his new textures endeavoured to make him look more celestial to fit that theme. His glowing eyes were now evocative of stars and the glasslike patterns on his body were reminiscent of constellations. Taken as a whole, Enigma was clearly meant to look like a portrait of the cosmos. Even in fan art Enigma actually seems like his body is a silhouette of outerspace. But his fundamental humanoid body did not change, and curiously, with the new textures, Enigma also became very, very fit. In Dota 1 Enigma was an inky floating mass—a truly enigmatic being. In Dota 2, he was still an uninspired tall, blue human, but now he also went to the gym. 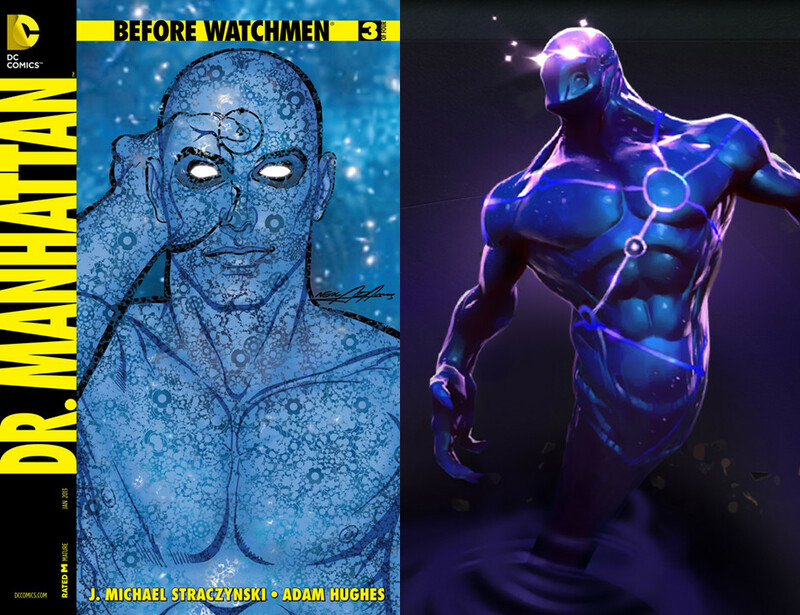 In fact, the "ripped" version of Enigma is eerily reminiscent of another work of fiction: Dr. Manhattan from the graphic novel Watchmen. Alongside The International 2015 Compendium Valve released a comic called The Summoning. 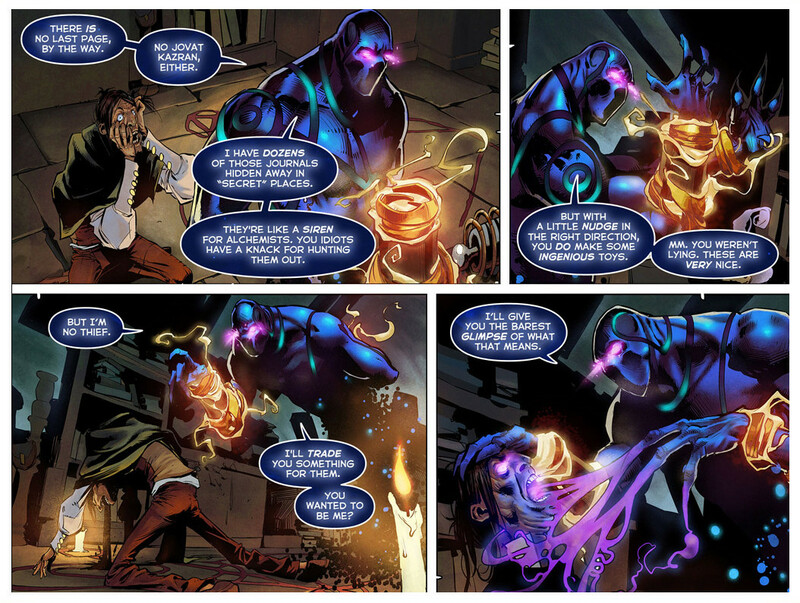 Enigma's design in the comic was consistent with his new onscreen look, indicating that—for all intents and purposes—this new buff Enigma was the finalized version. A little more trivia: The bracers Enigma takes from Cedric in the comic—the World Chasm Artifact—are a callback to the large bangles on Enigma's wrists in Dota 1. In the end, Enigma's overall design is uneven. While the current textures are high quality and mesh well with the theme of astronomy, the theme connected to his actual namesake of being a mystery was better done in the original game. It is a little jarring that in Dota 2 the hero that embodies the vast emptiness of space is basically just a tall guy with abs; the design inconsistency in this regard does unfortunately subtract from his grand mythos. Enigma's voice in Dota 2, unlike his design, was always good. His grim inflections and deep, resonating timbre befit the embodiment of fundamental nothingness. But what's even better is that many of his actual voicelines are infused with a a great deal of both science and of philosphy. We chose three of the most representative examples to analyze. After picking Enigma in the loadout screen you will sometimes hear: I stare also into you. This is a direct reference to the German philospher Friedrich Nietzsche who, when discussing the topic of madness in his work Beyond Good and Evil, said: "And if you gaze long into an abyss, the abyss also gazes into you." Thematically this aligns with Enigma's lore as a type of an elemental darkness in the universe who exists outside of morality. Finally, this loadout voiceline is common as well: Reality is illusion. This line is also a reference, this time to German-born scientist Albert Einstein who pioneered the Theory of Relativity. Einstein said: "Reality is merely an illusion, albeit a very persistent one." He suggested that every physical body in the universe, including subatomic particles, affects every other physical body whether we can see with the human eye or not. As radical as it might sound, this illusion plays out in principle in Dota 2 with what is known as the "threat of the Black Hole." As any experienced Dota player knows, the potential of Black Hole alone is enough to manipulate an entire teamfight as players on both sides will constantly position and re-position around Enigma. To an observer without Dota 2 knowledge this entire interaction does not appear to exist at all—it is just an illusion. A final piece of trivia: Enigma's arm motions while casting Black Hole are a direct nod to his arm motions in Dota 1. Do you prefer Enigma's model in Dota 1 or in Dota 2?